Friday March 14th 1902 Will went to town this morning to Dr Murphy's funeral. There was an immense crowd. The weather was nice. I swept the whole house and put things back in the parlor in the forenoon. In the afternoon I did dusting and took up the carpet in the kitchen. Mollie went home tonight. a letter from Laura Shirts. Saturday March 15th 1902 I was busy about the house most of the forenoon. Will went to town after an early dinner and Terry helped me do a big washing. The wind is blowing cold after the rain this morning. read in the evening. Sunday March 16th 1902 Very cold and a terrible wind blowing. I got the meals with as little work as possible and read a book. Mollie came after dark. Monday March 17th 1902 Weather intensely cold. I did not attempted to do much but got the meals. The men busy with the stock. 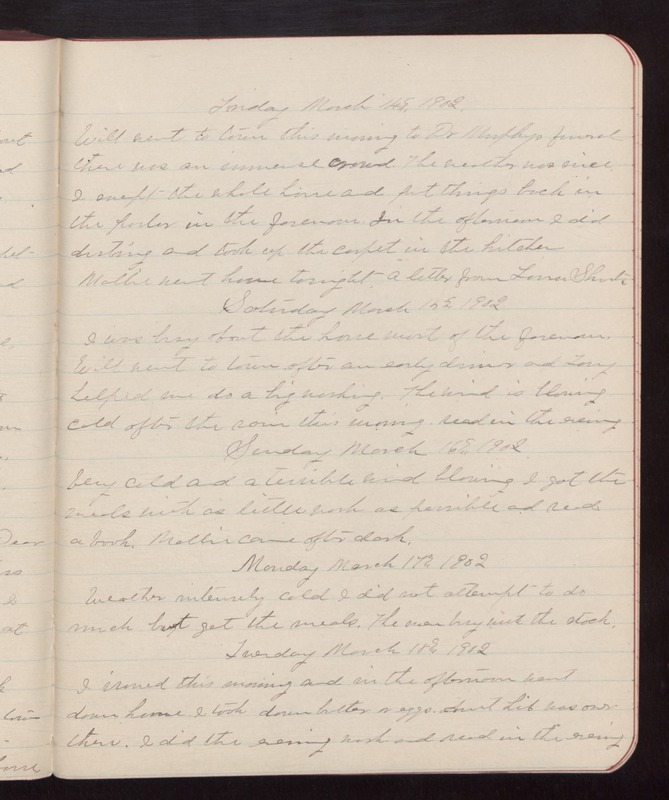 Tuesday March 18th 1902 I ironed this morning and in the afternoon went down home. I took down butter & eggs. Aunt Lib was over there. I did the evening work and read in the evening.